Ahead of the Feast of Saint Valentine this Thursday, February 14, Bishop Denis Nulty, Bishop of Kildare & Leighlin and President of Accord Catholic Marriage Care Service CLG, on February 12 blessed engaged Dublin couple Ms. and Mr. Killian at the Shrine of the holy relics of Saint Valentine in the Church of Our Lady of Mount Carmel, Whitefriar Street, in the Archdiocese of Dublin. The couple met while they were both working for Dell EMC in 2012 but according to Killian, their friendship didn’t blossom until meeting up socially after a Dublin GAA game in Croke Park, according to a release from the Irish Catholic Bishops’ Conference. Killian said, “We soon became strongly emotionally attached and our relationship has grown over the intervening years. We share many interests in life such as GAA, history, culture, travel and family.” Killian proposed to Emer at a romantic restaurant in Spain in October 2018 with a ‘promise ring’.” The couple then booked a trip to Dubai in November where they shared some great moments including picking the real engagement ring.” They will be married in 2020 in Rathfarnham, Co Dublin. 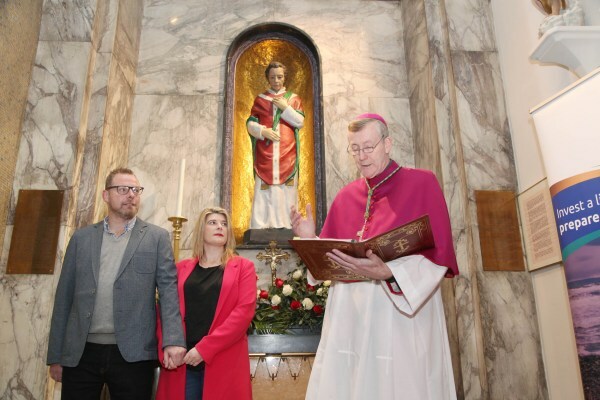 Speaking at the blessing, Bishop Nulty said, “This blessing ceremony of an engaged couple at the Shrine of St. Valentine around Valentines Day, organized every year by ACCORD, Catholic Marriage Care Service, is a much-anticipated event. ACCORD has been organizing this ceremony since 2008. “We gather here at the Shrine dedicated to Saint Valentine, a third-century Roman saint. It’s one feast day everyone knows, like St. Patrick’s Day on Marcy 17th or St. Stephens Day on December 26th. Everyone knows that February 14th celebrates Saint Valentine. Bishop Nulty continued, “The heart is very much the symbol of love and Valentines Day. It will feature on many a card or gift exchanged in two days time. The heart is at the center of our work with Accord as we continue supporting and accompanying couples towards a deeper understanding of the gift of sacramental marriage. The love of a married couple is a very special kind of love, a love that is life-giving, permanent and exclusive. Bishop Nulty went on to recall the words of Pope Francis in the same Croke Park at the WMOF2018 Festival of Families last August when he reminded us of the importance of supporting couples and families. “Our love and care must extend to all”, he said. “Accord is privileged to do that at different stages of a couple’s relationship”, Bishop Nulty said. Saint Valentine, a priest in ancient Rome, is regarded as the patron saint of couples in love, preparing for marriage and of married life. According to tradition, Saint Valentine was martyred on February 14, 250 AD. In 1836 relics that were exhumed from the catacombs of Saint Hippolytus on the Via Tiburtina, near Rome, were identified as Saint Valentine’s. These relics were placed in a casket, donated by Pope Gregory XVI, and transported to the Whitefriar Street Carmelite Church in Dublin where they continue to be venerated by the faithful to this day.